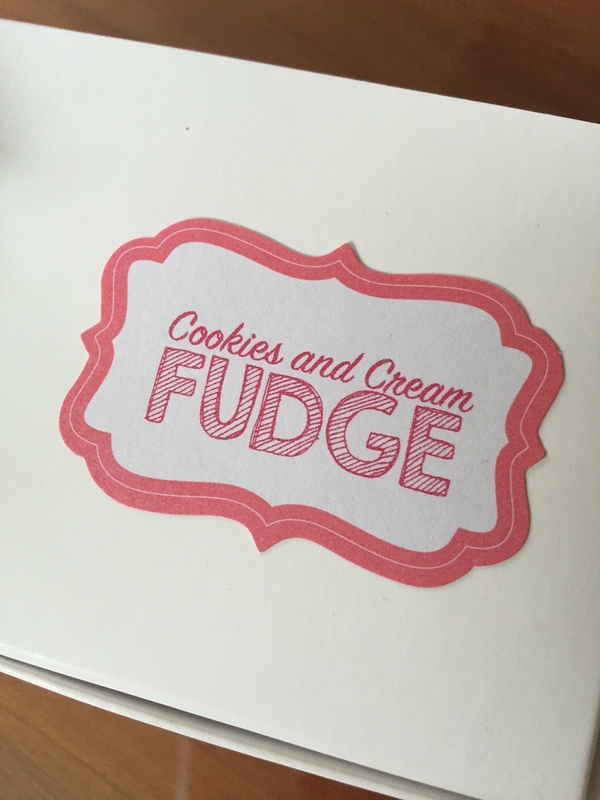 This past holiday season I took advantage of the gift giving spirit and shipped my baked goods off to friends in New York. 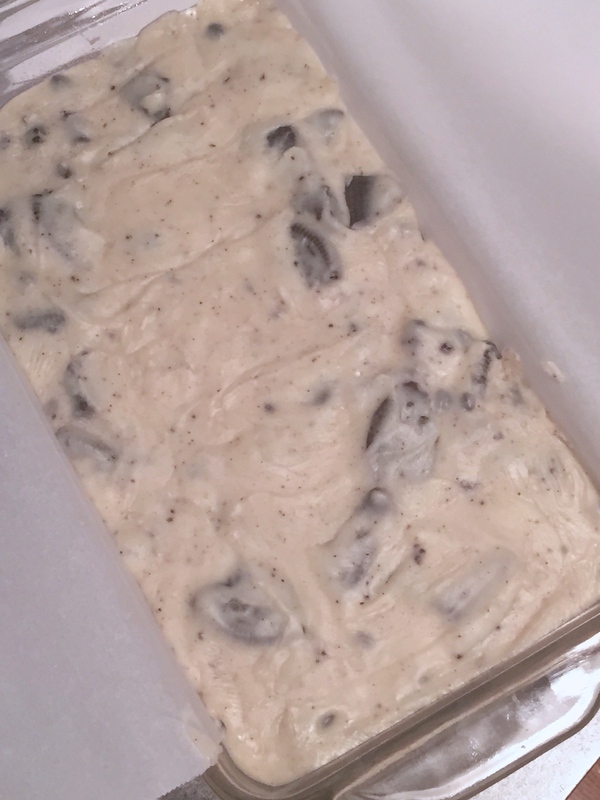 I found a really easy recipe for cookies and cream fudge and slightly modified it so I could send each friend a slab of fudge instead of squares. 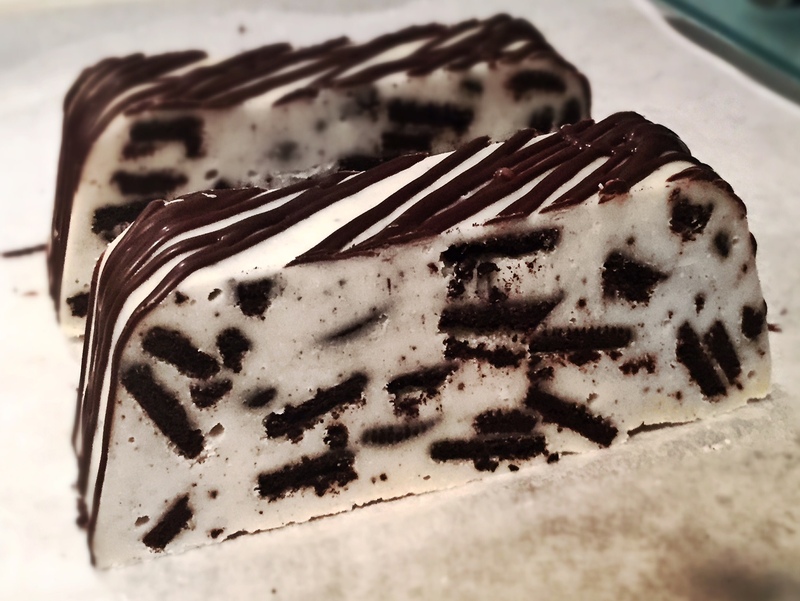 This recipe only has three ingredients: white chocolate, condensed milk, and Oreo cookies. It doesn’t get easier than that! First I placed the Oreos into a large mixing bowl so I could crush them with a meat pounder. Once melted together, I took the fudge mixture off the heat and mixed in the crushed Oreos. 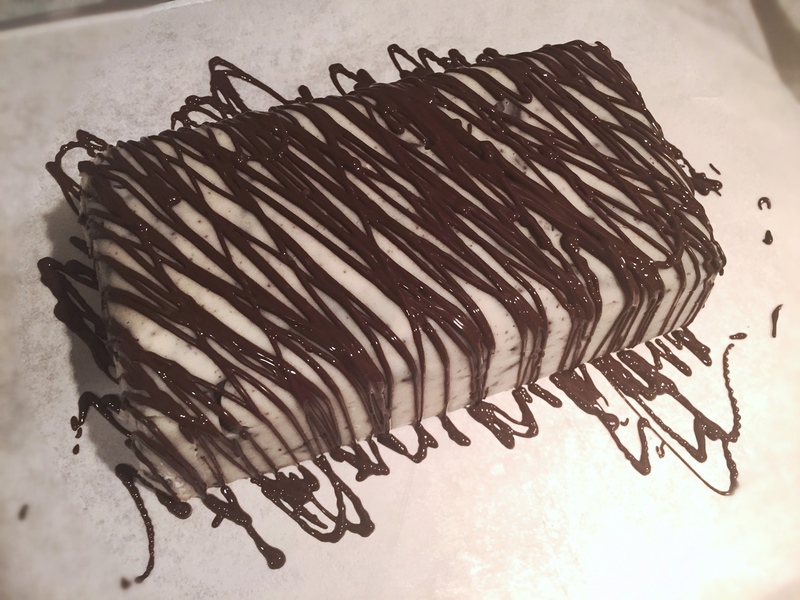 I then modified the recipe and poured the fudge into a parchment-lined greased loaf pan. Once the fudge has set in the refrigerator, you can remove the fudge from the loaf pan and flip it over. I wasn’t a fan of the molded slab look, so I decided to drizzle some dark chocolate to give the top of the slabs some texture. After the chocolate hardens, I sliced the fudge into 1 inch slabs. I was worried the slabs would look too molded, but they actually ended up looking cute! And they actually fit perfectly into the boxes I had bought! I wrapped each slab in some wax paper, placed one in each box, and made cute labels so my friends would know what they were eating. 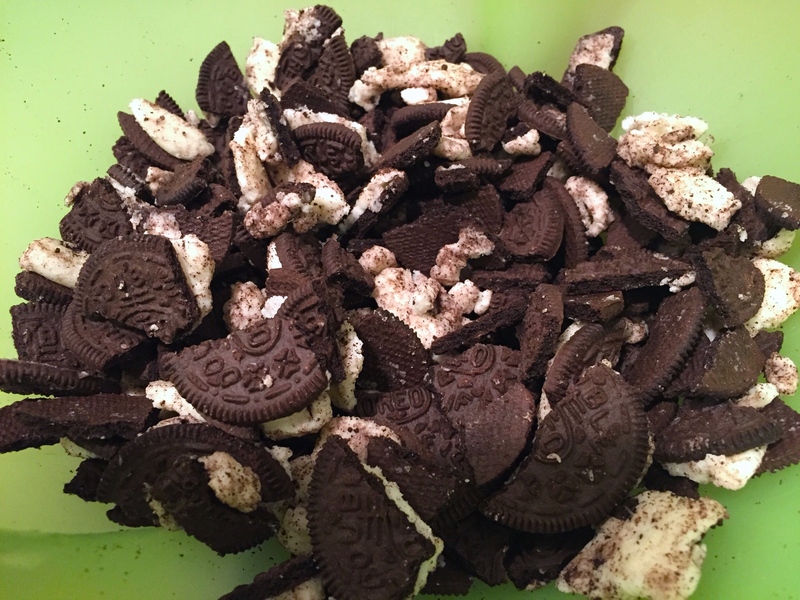 Place Oreo cookies in a large mixing bowl and crush until cookies are completely broken, but still in large pieces. 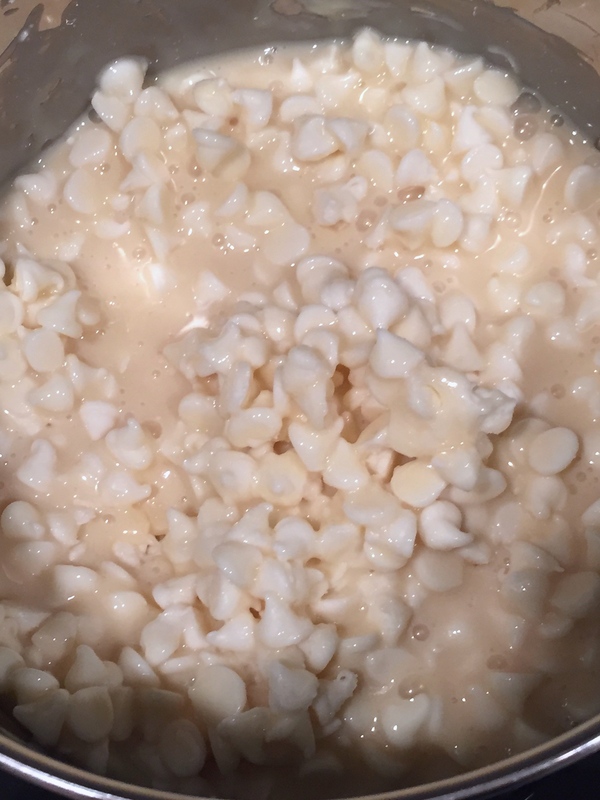 Heat white chocolate and condensed milk over medium heat until combined. Remove from heat and mix in the crushed Oreos. Pour fudge mixture into the loaf pan and spread evenly. Let the fudge set in the refrigerator (about 45 minutes or until hard to the touch). Pull parchment paper to remove the fudge from loaf pan. 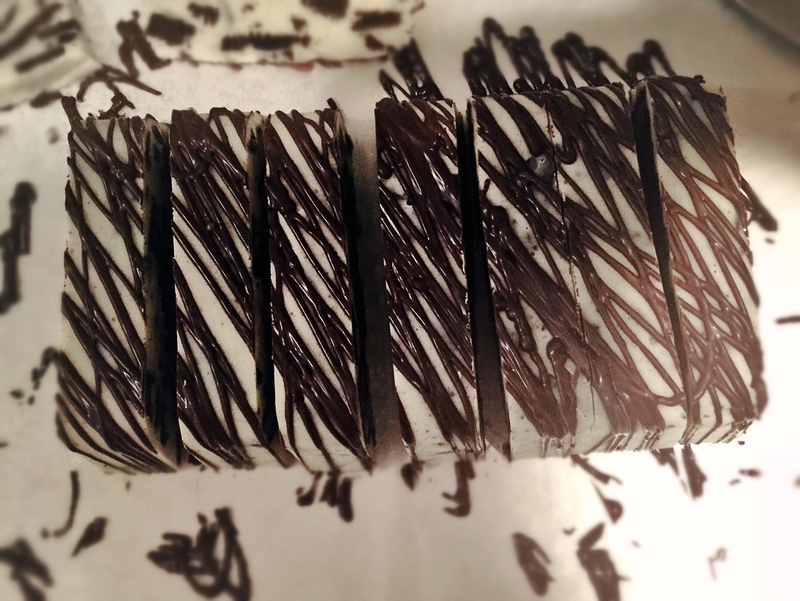 Lay the flat side down and drizzle melted dark chocolate over top and sides of fudge. Let chocolate harden. Using a large sharp knife, slice fudge into 1 inch slabs and enjoy. wow–you have a gift. (and these are gifts, haha) What I’m trying to say is that while this is a simple recipe, you made it look so very extravagant with the squiggles etc. And the packing and labels. Talented lady, you! Oooh this looks so so good!